Aneesh Chopra was the first Chief Technology Officer (CTO) of the Unites States government, and served in this position from 2009 to early 2012. Since then, he has run for the office of Governor in Virginia (but has not succeeded) and created Hunch Analytics, a company which crunches public and private data to “help executives and industry leaders in health care, education and energy to make smarter business decisions.” But this post is not about the latter, it’s about Chopra’s experience as the USA’s very first CTO, and his vision of how technology can improve governments. I got myself a copy. 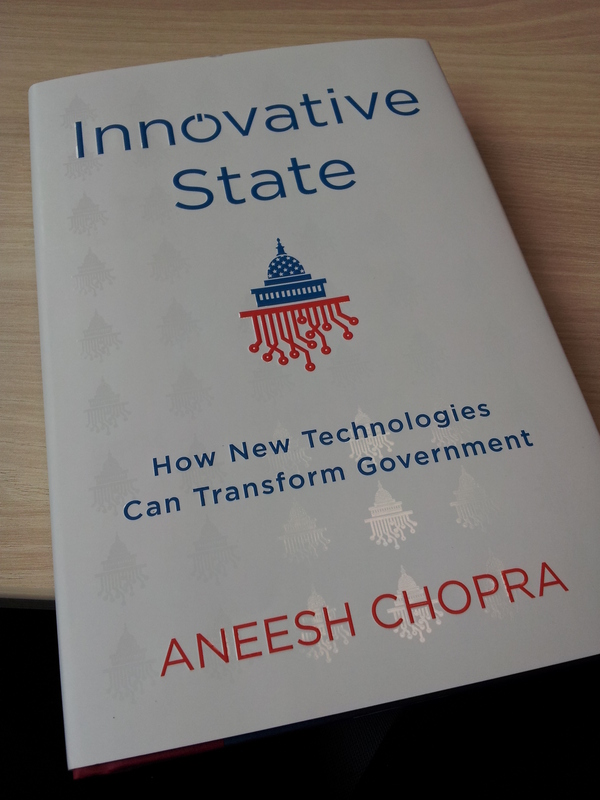 The cover looks great, the branding is sharp, and the opening words are “Government doesn’t work.” Chopra explains that public service has not always not worked in the United Stated (in fact he gives many examples of innovations that came from the public sector) but that the massive, hierarchical bureaucracy has emerged in the 20th century as a reaction to the massive, powerful corporations that made up the power of the United States. Since the 1960s and 1970s, he explains, trust in government has plummeted (“many citizens began to identify an inverse relationship between its size and its effectiveness“). In the 1980s, Reagan famously said that the government can’t solve problems, but that goverment is a problem in itself. In the late 1990s, well aware of the inefficiencies of the US public institutions, the Democrats led by Bill Clinton and Al Gore decided to tackle the problem. In the two following chapters, Chopra explains how he got to the White House, from his parents native country (India) to Jons Hopkins University (Baltimore, Maryland) and Harvard University (Cambridge, Massachusetts). He then worked in the private sector for a couple of years before becoming the fourth Secretary of Technology of the State of Virginia, where he led his first projects to improve public service. His mission as White House’s first CTO began in April 2009 (read Tim O’Reilly’s post). The video doesn’t only make fun of Aneesh Chopra’s nervous laughing during a White House live stream, an “endless, uncontrolled cackling” as he says himself (p.65), but it also mocks an example of the government’s missed efforts for transparency, a leaked security manual for contractors from the TSA (Chopra doesn’t talk about the leak in the book). “Chicken soup for the soul of terrorists,” Steward says. But that’s anecdodal. Chopra thought that the government, being a tool for citizen, should adopt a similar approach to some successful companies of the private sector. Why not launch challenges and partner with external stakeholders like P&G did? Why not build a platform for creative citizen to play with public data? Before leaving the CTO position, Aneesh Chopra wrote an in-house memo for President Obama, and released a public version of it called the Open Innovators Toolkit. One of the avenues suggested to make better use of taxpayers’ dollars and increase efficiency of public service is to use challenges and prizes, as we said already. Did it work? In May 2014, the White House brought out a report about the government’s first steps in organizing prizes and challenges. It says that by September 2013, Challenge.gov had featured more than 280 competitions from over 45 Federal agencies, departments, and bureaus, nearly half of which focused on the development of applications and many of them were based on the exploitation of public data. The health sector remains the prime area of ​​organizing competitions, the second being that of energy, which seeks to improve the energy efficiency of cars or to improve energy efficiency in general to reduce costs.“This look at the expanded use [of prizes and challenges] in fiscal year 2013 […] indicates the ways this authority will continue to help agencies across the Federal government reap the benefits of high-impact prizes,” the report’s summary says. One of the most active users of challenges is NASA, which just announced a new challenge to build climate applications based on satellite data. While France has experimented with Open Data, to my knowledge this is all our State has done among the propositions of M. Chopra. Not that all solutions apply equaly to all countries of the world – I wouldn’t say that – but it is still striking to see that the world’s biggest moving economy is moving so fast while a European country like ours is tumbling along, (too) slowly embracing the digital economy, hindering many innovators to participate in the citizen efforts that Aneesh Chopra describes in the book. You say that prizes and challenges allow to better employ taxpayers’ money and rationalize State expenses. But haven’t you been faced to criticism from worker unions which felt threatened by these expense rationalizations? Have there been people who said that you were outsourcing the work of federal agencies to tax paying citizen? That you were encouraging spec work by facilitating competitions? I have the impression that in France, if we implemented a lot of the programs you describe in the book, such criticism would arise.